Pyrrho of Elis went with Alexander the Great to Central Asia and India during the Greek invasion and conquest of the Persian Empire in 334–324 BC. There he met with early Buddhist masters. 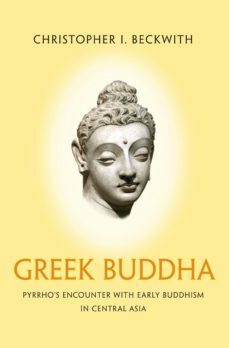 Greek Buddha shows how their Early Buddhism shaped the philosophy of Pyrrho, the famous founder of Pyrrhonian scepticism in ancient Greece.Christopher I. Beckwith traces the origins of a major tradition in Western philosophy to Gandhara, a country in Central Asia and northwestern India. He systematically examines the teachings and practices of Pyrrho and of Early Buddhism, including those preserved in testimonies by and about Pyrrho, in the report on Indian philosophy two decades later by the Seleucid ambassador Megasthenes, in the first-person edicts by the Indian king Devanampriya Priyadarsi referring to a popular variety of the Dharma in the early third century BC, and in Taoist echoes of Gautama’s Dharma in Warring States China. Beckwith demonstrates how the teachings of Pyrrho agree closely with those of the Buddha Sakyamuni, "the Scythian Sage." In the process, he identifies eight distinct philosophical schools in ancient northwestern India and Central Asia, including Early Zoroastrianism, Early Brahmanism, and several forms of Early Buddhism. He then shows the influence that Pyrrho’s brand of scepticism had on the evolution of Western thought, first in Antiquity, and later, during the Enlightenment, on the great philosopher and self-proclaimed Pyrrhonian, David Hume.Greek Buddha demonstrates that through Pyrrho, Early Buddhist thought had a major impact on Western philosophy.